We are living in what we call ‘the age of convergence,’ where the distinction among technology, media, or cultural elements become meaningless as they go through development and convergence while new cultural phenomena and social structures. This process of convergence is now becoming a concrete reality through the collaboration among diverse agents that correspond to the complex change of the time. However, it does not remain on the superficial level of convergence between information technology and media, human and machine, virtual and physical space, etc. The meaning of such a convergence is expanding with more freedom and flexibility, particularly in the field of art. Art Center Nabi has been emphasizing convergence and collaboration since the establishment of institution in 2000. Art, technology, science and related industries have all been Art Center Nabi’s areas of interest to facilitate exchanges and communications. 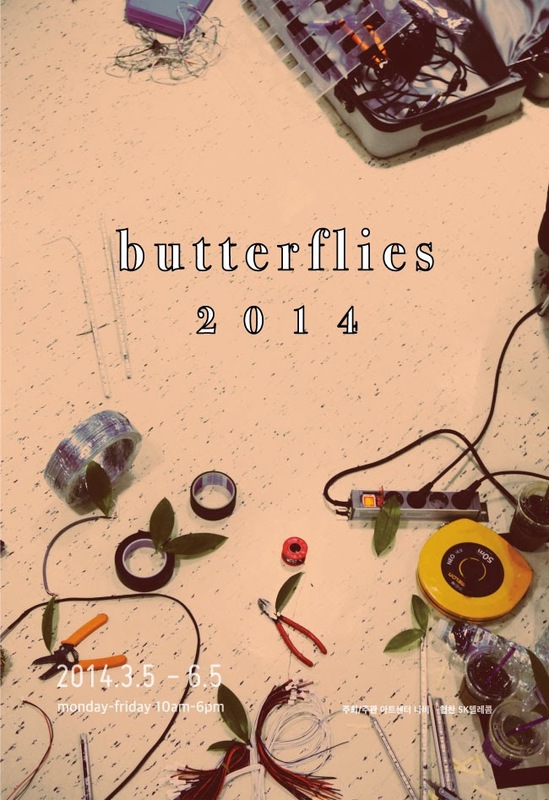 《Butterflies 2014》 is an exhibition that highlights artistic activities that are moving toward the convergence beyond the boundaries of different genres such as art, architecture, design, media art, science and so on. The current exhibition especially introduces a range of collaborative methods which the institution has tried in the past year of 2013, presenting diverse creative projects produced during the process. Proposed and produced through new platforms and convergent encounters such as Hackathon, creative workshops and the meeting between art and industry, the new kind of creative activities and ideas are provided through their final form of production. In addition, the current exhibition also presents a wide range of materials including photographs, publications, interviews and video documents to share the creative process of producing artworks. The creators who participated in the exhibition recognize communication as an important goal of art and convey the spatiality and relations - recreated upon the relationship with the surroundings – through their diverse works. Further, they propose and experiment with creative activities with an aim to change individuals and the society on the point of encounter among art, technology and society. They also attempt to draw the possibility of sustainable life through values of open and sharing. As a designer expanding to the field of media art, Zinoo Park presents 〈Lighting Lab〉, a work that examines the nature of lighting upon the change of light and material characteristics. A collective of two artists Bang & Lee introduces 〈Friendship is Transparent〉, a visualization of signals transmitted through fiber optic cables, to tell about the value of information in the age of social media. 《Butterflies 2014》 also presents 〈Optimistic Optimist〉by Optimist, a participatory work that employs interactive works of facial tracking technology, and 〈The song of the moon〉 by Jayoung Chung, which is a total art in which the Korean spirituality is materialized through the combination of Gayageum performance and new technology. Along with the aforementioned artists, node.class introduces an interactive work that proposes a new spatiality and temporality through the properties of the medium of digital projection; Opener, a media art group that has been examining the new field of art and design in combination with technology, conveys the beauty in the old and discarded things through recomposition; Sunme Lee suggests the relationship between an individual and the collective through a light-shadow work that uses different refractive indexes of lenses from discarded glasses; Taiyun Kim proposes a new structure of communication through 〈Fluid State Lighting〉, a work that symbolizes the age of IoT(Internet of Things) in which every object react to the flow of information in a flexible manner; IVAAIU City Planning, a multimedia architecture group based on urban architecture, introduces an architectural structure with an ability of movement and reorganization to move beyond the boundary of standardized spaces and implement communications; Hyun Park, a founding member of Fab Lab Seoul and a professional creator of kinetic models, focuses on the game-changing trend from the emergence of new materials and production methods. Through models produced by a 3D printer made by the artist himself in a D.I.Y. way, he emphasizes the fact that the development of new technology accelerates the changes of the time, bring about changes in social structures and paradigms. Exhibited in Art Center Nabi – located in the middle of the city center, the current exhibition aims to be a natural part of people’s daily lives by providing comfort and cozy environment to appreciate artworks with a café within the exhibition space. Along with the approach, the exhibition also aims to have an open structure in which viewers observe, consider and participate in artworks. For those who visit Art Center Nabi, 《Butterflies 2014》 will be a time of reflection on the genuine meaning of abundance through the sharing of artistic concepts that lead the change of individuals and society with the extended qualities of digital media and convergent creativities.